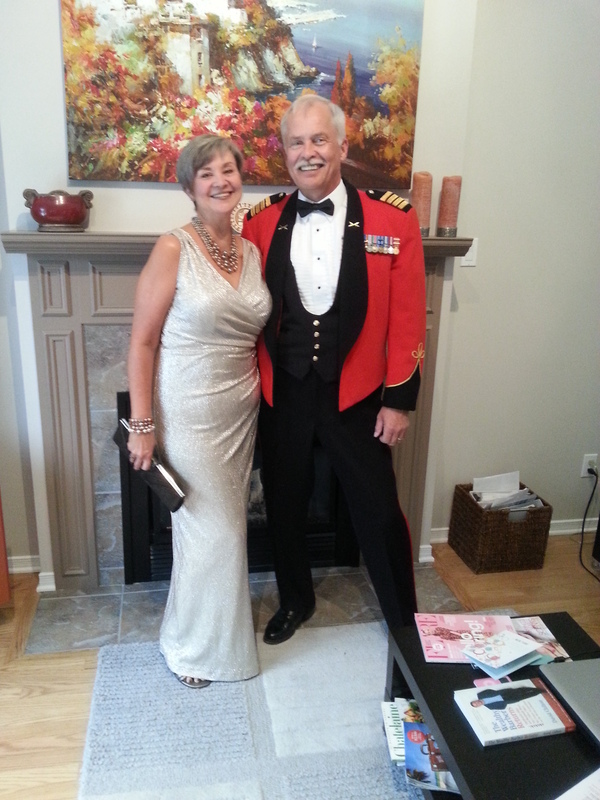 The Army Ball – 2013 version | Turning my world upside down! Few events are more exciting to me that sitting in a ballroom with a bunch of handsome men in uniform. I mean, come on!! And the best thing is that I am married to one of those men, so I get to share the evening with him and talk about it later when we return home. 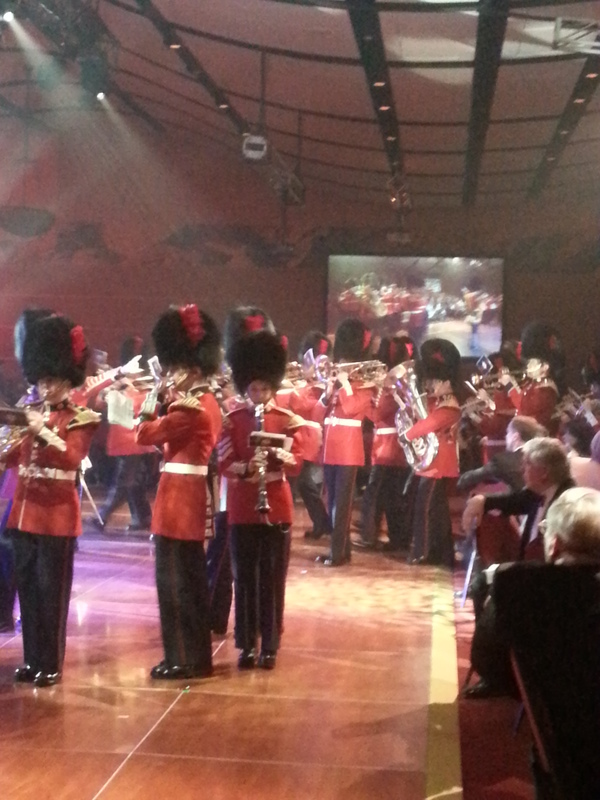 This year’s Army Ball was themed for the 200th anniversary of the war of 1812 (which actually lasted 3 yrs). If you don’t know much about this war, it was basically the Americans invading what was British North America (aka the soon to become Canada). 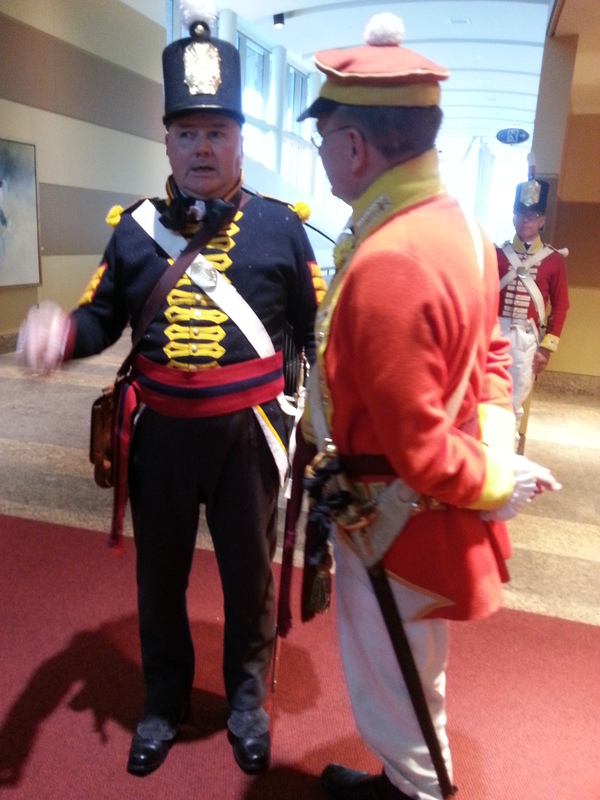 Canadian troops were made up of British military, militia, First Nations people and quite a few French Canadians. Some of the notable heroes that came out of that war were Laura Secord, Sir Isaac Brock and Tecumseh. After the war, some of the loyalists were given lands in the Perth, Ontario area, just south-west of here, where they settled their families. These are the ancestors of a great many of our local residents. With that in mind, guests were greeted by 2 members of the RCMP and 2 members of the RCH (Royal Canadian Hussars from Montreal) on horseback, dressed in ceremonial uniforms. I, unfortunately, was not greeted so grandly, as Leon and I arrived quite early since he had some very important duties to attend to – greeting the VIPs as they arrived. Since we had a bit of time, I visited the ladies room while Leon went about his business, only to find a group of ladies dressing in period costume. I volunteered my services to help with their make-up, which was a fun way to occupy my time. The ladies were mostly members of the choir (the Army Voices) and entertainers for the evening, so they mingled in with the guests during the cocktails, along with several re-enactors. Dinner began with a show and the introduction of the head table. Our menu consisted of cream of asparagus soup, salmon tartar, filet of beef, chocolate brownie with white chocolate sorbet and mint creme anglaise and an assortment of chocolates and cookies. The wine flowed but we were trying to be moderate in our consumption. 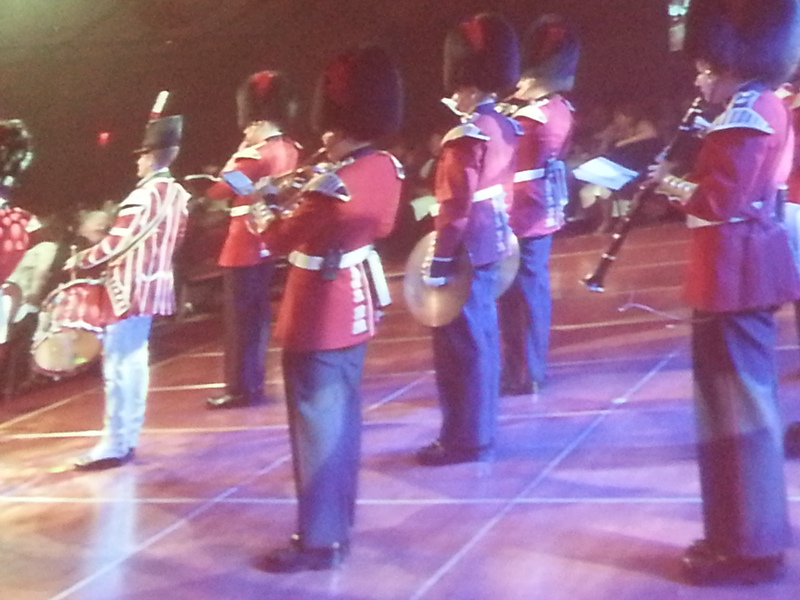 The main show then started with re-enactors, singers in period costume, the Cameron Highlanders of Ottawa Pipes and Drums and the Regimental Band of the Governor General’s Foot Guards (under the direction of our friend LCol Fran Chilton-McKay). It’s hard to describe the pageantry of such an evening. For people who’ve never attended such a formal military celebration, you might be in awe of all the tradition and symbolism that goes into it. Or perhaps it’s not something you value. At any rate, I tried to get some pictures of the musicians, but it’s hard not to show people’s faces, something I don’t like to do without their permission. Suffice it to say, you can at least get an idea of the detail of their uniforms. GG Foot Guard Band with one member out front in period costume. 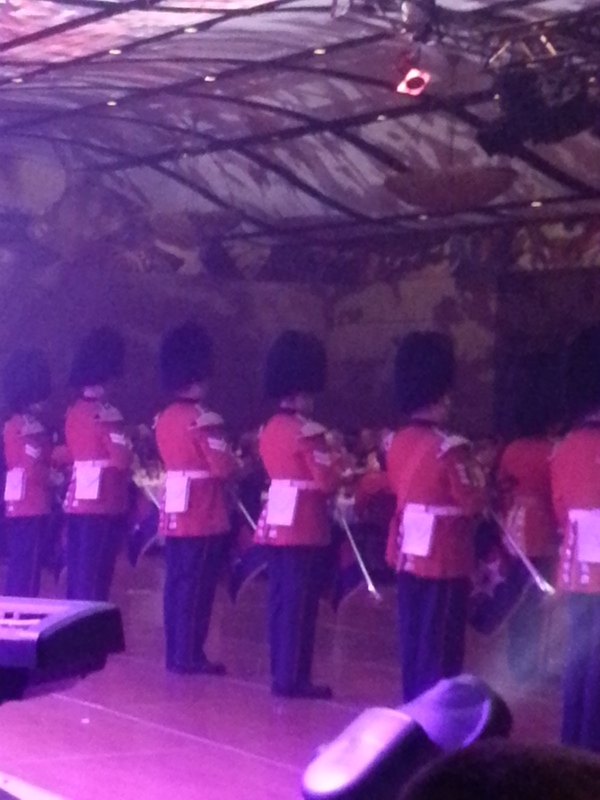 GG Foot Guard Band – notice the bearskin hats like at Buckingham Palace. As for the rest of the crowd, the ones not in uniform, well let me say that I did not feel overdressed this year. I had chosen a champagne gown and forgot that so many ladies in Ottawa like to dress conservatively at these affairs, so I was a bit apprehensive about my choice. It turned out there were at least 3 other ladies in gold dresses and an incredible variety of very chic outfits. When you look at how regal the gentlemen look in their finest (sorry, I don’t like the ladies’ dress uniform nearly as much), you can imagine that it’s hard to come up with an outfit that will complement your partner’s, not clash with it. As the weather was unseasonably cold last night, I had considered wearing a fake-fur cape that I borrowed. However, I settled on a pashmina of burned-out velvet that I purchased in Turkey a few years ago, held together with the regimental broach Leon gave me a few years ago. 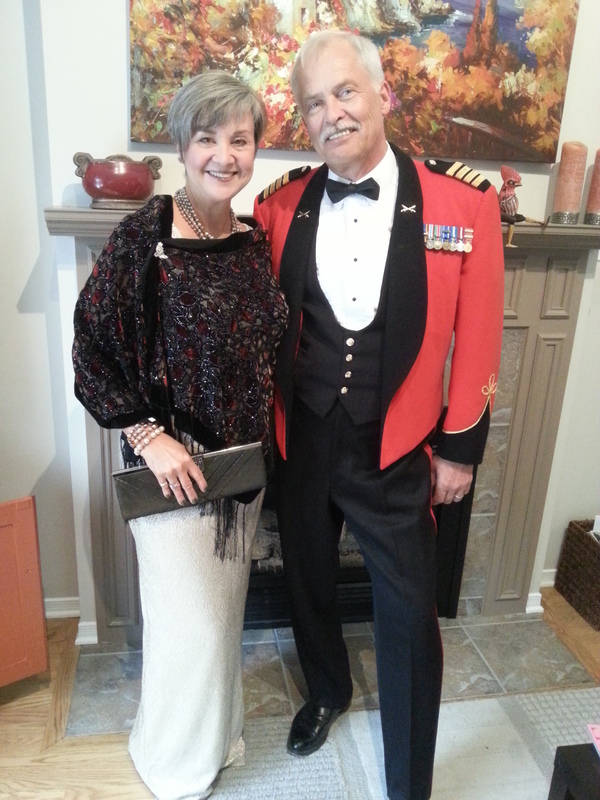 The broach is very special to me as my father was in the Royal Canadian Artillery (as is my husband) and I remember my mother saying how lovely it was to see all the ladies wear their husband’s regimental broachs when they would go out for an evening during the war years (WWII). The souvenir teddy made himself at home among Leon’s military memorabilia. We haven’t found a name for him or his sibling yet. The evening concluded with a whole lot of dancing – I love to dance with Leon! And I needed to burn off that dessert. We were all given a lovely parting gift. Usually, that would be some form of glassware – wine glasses, sherry glasses, etc. with the Army crest etched into it. But this year, surprise! a sweet teddy bear dressed to commemorate the War of 1812. The sexier dancing look. How hot are we?? My conservative look for dinner, note the Regimental Pin on my wrap. Sounds like a fun evening – love the period costumes too (and yours, of course!). I’m hoping for more period costume opportunities in months to come. Probably at another Mess dinner. Yeah! Me too! Thanks Brian! What a coincidence….my two favourite Gunners….Jensen and Dallaire both have very similar mustaches….!!!! You look amazing! What a wonderful evening this must have been. Thanks for sharing the pictures. You make such a handsome couple. That is a high compliment indeed coming from you. Susan, you would have loved the dresses and the elegance of so many women. The Chief Justice is so gorgeous with the best grey hair, EVER! I loved how she introduced herself to me as Bev and her husband Frank. How sweet! A cute anecdote is that no matter the price of the dress, people commented on my $10 Turkish scarf more than anything.